Cutting(Slashing) the outline　" Kirimawasi "
First, cutting the block. pull the knife towards you while inclining it slightly towards the outline of the picture. 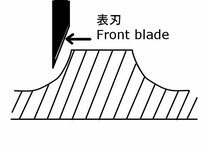 At that time, it is important that front surface of blade is facing the side of the color-block. 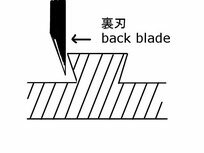 (Ukiyo-e carving is an exception) If using blade in reverse, blade sunk on the inside of the block, the edges of the block becomes weak. In addition , the edge will be chipped at the time of printing. In addition, cutting the outside of the transfer line is important. Because, it is to avoid making a gap between the color-blocks to each other at printing. 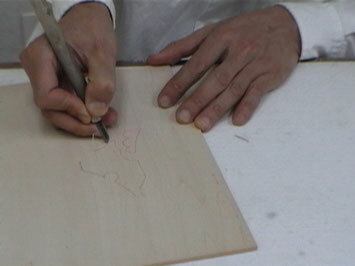 Carving grooves of the V-shaped " Yagenbori "
Again,using the knife a second time, make a groove of V-shaped between the unnecessary parts(margin) and necessary color-block by slashing just near the slash-line "kirimawasi" with the knife. It make V-shaped cuts like those made with the veiner. Do you know that wood is rolled up like a string in the left image? By doing so, it becomes easier to cutting out the unnecessary parts. 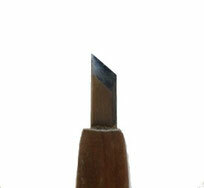 Also at this stage, shave the registry mark "Kento" using a flat chisel and knife. "Yagenbori" is like those cutting with the veiner. Cutting out the verge " Kiwabori "
Cutting out the verge of the necessary block, to make a trapezoidal slope using a gouge. Cutting(Shaving) out the unnecessary parts " Sarai "
Cut out the unnecessary part by using a gouge. And, smooth the irregularities as a whole using flat chisel. Color-block of ”a” is printing of the mixed color-Gradation "Tsukeawasebokasi". It is widely shaving(cutting out). Because the motion of brush is a certain direction. Baren pressures a place different from a collar-block surface at printing. If the outer edge of cutting-out "sarai" is not smooth, washi-paper will be scratched. 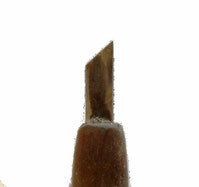 Making the smooth edge using flat chisel is important.